Even though many customer have already started with SAP HANA, some still need their existing analytics based on SAP BWA for a certain time until they have migrated towards BW4/HANA. 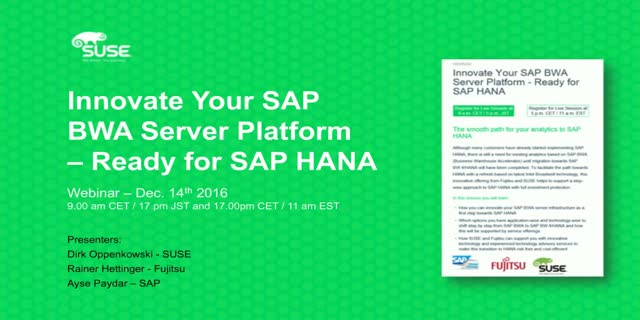 To start the smooth path towards HANA with a technology refresh based on latest Intel Broadwell technology, this offer from Fujitsu and SUSE could be very interesting to support a step-wise approach to SAP HANA, with full investment protection. - Learn how SUSE and Fujitsu can support you with innovative technology and experienced technology advisory services to make this transition risk free and cost efficient.